Arguably the most important step in creating a costume, not just in terms of safety, is the planning stage. Here is where you decide how you are going to construct the garment(s) and accessories that will make up the costume, and what (if any) changes need to be made to the design. Now, in a culture where degree of detail and accuracy is so highly praised departing in any way from the original source material may seem counter-intuitive, but it is actually quite common and accepted – when done well and for the right reasons. Two dimensional drawings don't have to adhere to the laws of physics like a three dimensional garment or prop does. Furthermore, not all of us have the same body type as the characters we choose to portray, especially if said character is not human. Really though, there can be any number of right reasons to take “creative license” when creating a fan costume, any of which will be more or less accepted by the greater community. The point is, it's you're costume and you should be able to make it however you please (though I personally argue you should always have a distinct reason for making a change...but I'm getting off topic). Sometimes design changes must be made for a matter of logistical safety. Most often these are cases of very large aspects that would be difficult to handle at full scale. For example, were someone to create a full scale replica of, say, Sephiroth's wing it would first take a great deal of strength to balance, second not likely fit through doorways, and third cause a hazard for those walking around nearby. That is not to say seeing a full scale wing wouldn't be impressive, but we need to remember that convention halls are not a controlled environment. We have no idea what will be going on around us or how crowded the space will be, though I usually assume the worst case scenario of hyperactive teenagers running around in a densely packed crowd. If you are really dead set on creating a full scale replica of something large, I would suggest using it in a private photoshoot somewhere other than a convention where you have more control of the surroundings, and if you wish to wear the costume at a con simply make a smaller version of the large part that will be easier to manage. Another area you want to look at, besides large parts of your costume, are the shoes. Some of the more intricate or ornate footwear found in cosplay source material is incredibly impractical. Remember that anything worn on your feet will need to bear not only your weight but that of your costume as well. Take care with any sort of platforms or high heals that the weight is distributed such that you can balance well, or you could run the risk of twisting or even breaking your ankle. You also want to avoid anything that will cause serious blisters, or else add padding to limit irritation. Don't forget to include comfortable soles if at all possible, as this will help against fatigue if you are on your feet the whole day as many of us are apt to be at conventions. Equally as important as any design choices is your choice of materials. This will be partially informed by the source art, but you also need to consider the environment you will be wearing the costume in and what effect it's comprising materials will have on your body. For things like armor or prop weapons you should should choose based on weight and durability, finding the lightest material you can possibly go with without hindering structural stability. After all, what's the point in having a replica of InuYasha's Tetsusaiga if you can't even lift it? Just remember that any materials layered atop each other in large quantities will increase in weight; consider making things hollow if possible. You also need to take local temperature into consideration. This comes into play both in terms of what costumes to bring to which events, as well as what materials to make any new costumes of if you have a specific event in mind to debut them at. 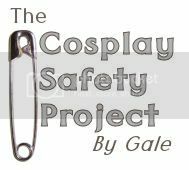 If you are wearing a costume at, say, Otakon, which is held in Baltimore, MD in the middle of summer, you probably don't want to wear anything made of heavy wool or non-breathable pleather or anything else that will insulate your body heat. Contrastingly, at Katsucon in Washington, DC in February (often nicknamed Katsnocon in the occurrence of snowstorms) you probably wouldn't be too comfortable in a bathing suit or silk dress. Granted most convention venues usually have good temperature control, but you don't always have the luxury of staying inside, particularly when it comes to finding the best photo backdrops. Once you know what you want your finished product to look like, and what materials you will be using, you need to figure out what methods and tools you will use to put your costume together. There are countless options that differ more or less depending on what materials you use – far more than I can go through here. Whatever you choose to do, however, be sure to research anything new to you and make sure you follow any suggested safety guidelines.